It's with a heavy heart that we announce the sad demise of Amit Kumar Singh. He was battling lung cancer since November 2017 and underwent 6 rounds of chemotherapy until May of this year. Low post-chemo immunity took a severe toll on his health and he succumbed on August 8, 2018 fighting multiple infections during the last days of his life. 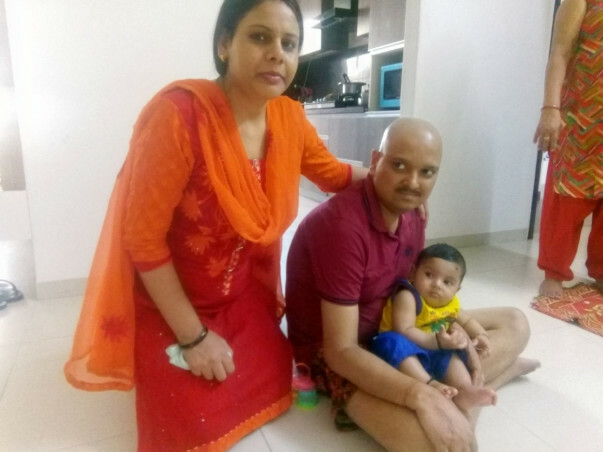 Amit was 35 years old and is survived by his wife, Rachana - a homemaker, and an 8-month old infant son. He was an IT professional based out of Kolkata. He was a hard working person of high moral values, dedicated to his work, a determined achiever of goals, steadfastly loyal to his family and colleagues and above all the quintessential friend in need. Amit was like almost any of us. When you consider that he was a vegetarian, non-smoker and a lifelong teetotaler, it is but another reminder of how any beautiful life could be so cruelly cut short by unforseen and unimaginable circumstances, leaving behind not just friends in shock but a family with an irreparable and excruciating loss to bear with. Amit's son will grow up without the love, guidance and zeal to succeed without a father. He is but an infant who will spend years simply having to learn but never actually see how his father lived. In this difficult time of need, Amit's family needs all the help that can be mustered. If you could support this cause by making a contribution, it would be another meaningful step towards stabilizing this family after their 10 month ordeal fighting cancer. Please pass on the message to your friends and families and help rebuild the lives of Amit's family to some semblance of their former selves. Thanks a lot for your contributions and Amit Singh Family has invested funds in LIC policy for Kids. We are very thankful to you all. I would like to inform you all that with the funds from this campaign, Rachana and her son will be able to get LIC life insurance. This will help them in their future. Their future is being secured because of your contributions and we will always be grateful to you all.